1 Rinse chicken breasts and pat dry. In a pan, heat about 2 tablespoons olive oil and cook chicken on both sides until done. Let cool briefly and cut into small cubes. Squeeze lemon juice from half a lemon into a bowl and add 2 tablespoons olive oil and season with salt and pepper. Mix in chicken and set aside. 2 Rinse scallions, drain and pat dry and chop. Peel avocado and cut in half and remove pit and cut into small cubes. Puree half of avocado pieces, 2 tablespoons creme fraiche and 1 heaping teaspoon herb salt and stir in scallions. 3 Toast bread until golden. Mix avocado cubes and avocado cream. Squeeze juice from remaining lemon half into avocado mixture and season with salt and pepper to taste. 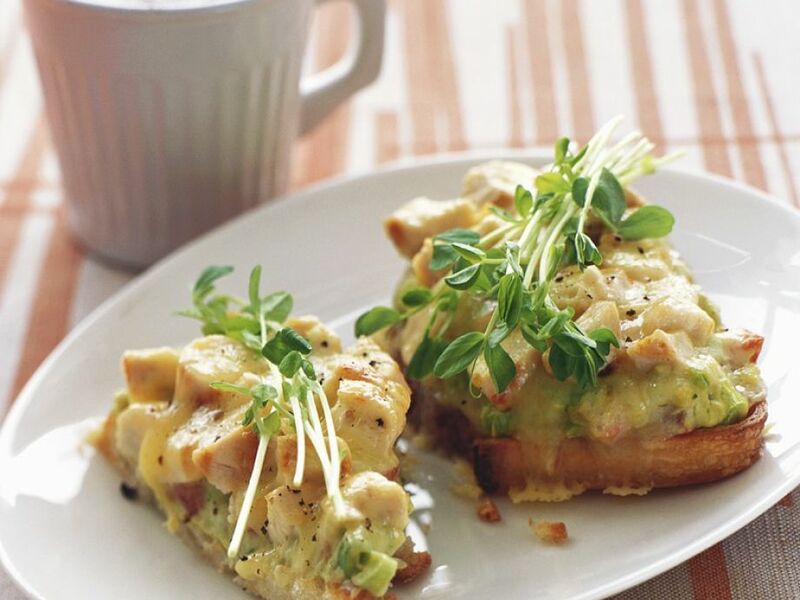 Spread avocado mixture over toasted bread in a thick layer and add chicken. Sprinkle with mozzarella and season with pepper. In preheated oven, broil until mozzarella melts but does not burn, watching carefully. To serve, garnish to taste with watercress or sprouts.